Happy Thursday Team Stryker fans! 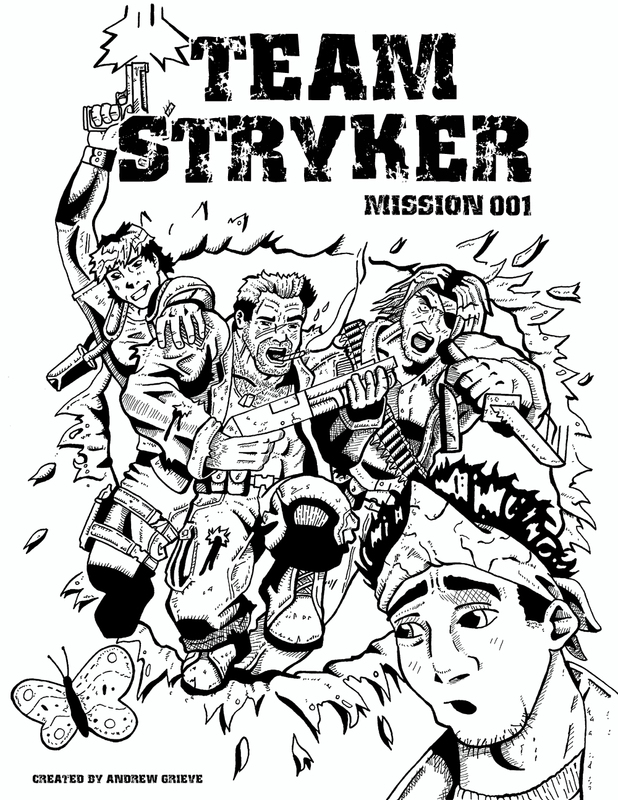 In order to get Team Stryker Mission 004 ready for its release early next year I’m going to take a small break from releasing Mission 003 and instead give you a behind the scenes look at some of the earlier works of Team Stryker! The cover to Mission 001 was drawn back in the summer of 2008 and was the last page I drew for the issue. I wanted to make sure I had the characters nailed down after drawing 12 pages before I went back and did the cover. I wanted it to be explosive and something similar to the first issue of Giant Size X-Men. There are no pencils to this page because when I drew this I wasn’t thinking long term and just inked over the original pencils. I didn’t start separating my pencils and inks until I did the cover for issue 3. Team Stryker has always been a learning experience and with every mistake I learn something new. I hope you enjoyed this behind the scenes look into the first page of Team Stryker! Be sure to check back on Monday for the alternate colored version of this page. Have a great weekend every one!